You can use a graphical way to know which investor, home or foreign, can make use of the covered interest arbitrage to earn excess returns. In the figure, on the y-axis, you see the interest rate differential. The x-axis indicates the forward premium or discount, as measured by ρ. You also know that ρ can be positive (forward premium on foreign currency) or negative (forward discount on foreign currency), which is indicated by the positive and negative x-axis. The 45-degree line indicates when the IRP holds. Assuming no transaction costs, the IRP holds when the forward premium or discount equals the interest rate differential. However, more clarity is needed on which forward premium or discount is relevant here: the one that reflects the bank’s ρ. If the bank’s forward rate reflects the IRP-suggested premium or discount, you’re on the 45-degree line. This line indicates that the IRP holds; therefore, neither investor has an opportunity to make excess returns based on covered interest arbitrage. What happens when the IRP doesn’t hold? Look back to the last numerical example with American and European investors. In that example, the nominal interest rate differential between the dollar- and euro-denominated securities is -0.44 percent (0.16 – 0.60). However, you calculated the bank’s implicit forward premium on the euro to be +29. 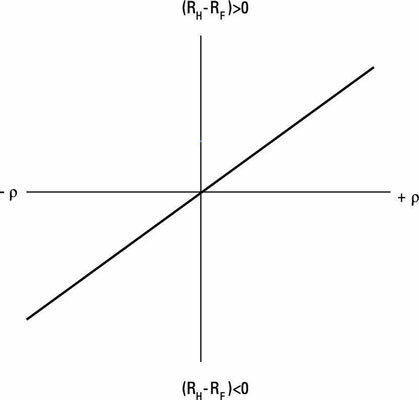 Therefore, in terms of this example, you are certainly not on the 45-degree line in the figure: You’re below this line and in the fourth quadrant (because of negative interest rate differential and positive ρ). Generally, the area below the 45-degree line implies the area where the American investor (home country investor) earns excess profits from covered interest arbitrage. Note that this area includes parts of the first and third quadrants and the entire fourth quadrant. If the interest rate differential and ρ fall into the area above the 45-degree line, including the parts of the first and third quadrants and the entire second quadrant, the European investor (foreign country investor) earns excess profits. A word of caution: Some of the examples show large rates of returns. The probability of enjoying such high returns in real life is small.